1997, the work continues as more than 5000 members of her orders and other volunteers operate about 500 facilities around world, feeding 500,000 families and assisting 90,000 lepers each year. .The woman who saw herself as only God's servant was born Agnes Gonxha Bojaxhiuin in Skopje on August 26, 1910 , the daughter of Albanian parents, in what is now the capital of the former the former Yugoslav Republic of Macedonia . She joined the Sisters of Loreto age 18 and trained at the motherhouse in Dublin , Ireland , where she chose Teresa as her name in religion after the renowned Saint Th‚rŠse of Lisieux, the patron of foreign missionaries. In December 1928 Sister Teresa was sent to Darjeeling , at the foot of the Himalayan Mountains in India where she completed her religious calling and took her final vows. 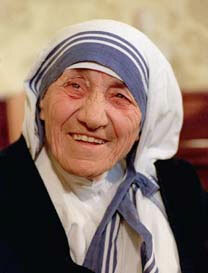 Then in January of 1929 she arrived in Calcutta , capital of Bengal where she was to teach at a girls' school. However, the constant sight of the dead and dying on the city streets created a compassion that she would carry for many years. care of the sick and the dying, the hungry, the naked, the homeless - to be God's Love in action to the poorest of the poor. That was the beginning of the Missionaries of Charity." simple white sari with blue bands that symbolized God's will. The nuns of the new order took the usual vows of poverty, chastity and obedience but Mother Teresa added another: service to the poor that she believed served as the embodiment of Christ. Hindus. Within 24 hours we brought our sick and suffering and started the Home for the Dying Destitutes." home as needed. In 1953 the order opened its first orphanage and several years later they began caring for lepers. labor made her so worthy that, in reality, she gave honor to the prize, rather than the other way around!" She always accepted any award on behalf of the poor people she served and immediately invested any prize monies into her work. John II approved the beginning of the canonization process and the ceremony of beautification, a first step to declaring her a saint of the Roman Catholic Church, was held on October19, 2003 in Rome . University , Warrensburg , Missouri (1968). encouragement newsletter "Rainbows Along the Way."